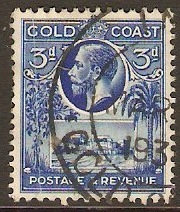 Gold Coast 1928 2d Slate. SG106. Mounted mint 1928 2d Slate. SG106. 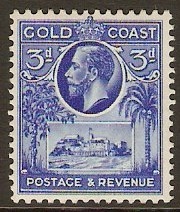 King George V definitive stamp. 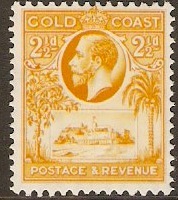 Gold Coast 1928 2½d Orange-yellow. SG107. 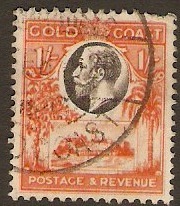 Unmounted mint 1928 2½d Orange-yellow. SG107. 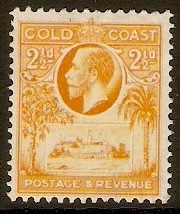 Heavy mounted mint 1928 2½d Orange-yellow. SG107. 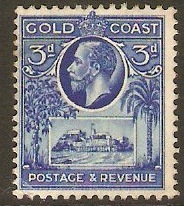 King George V definitive stamp. Gold Coast 1928 3d Bright blue. SG108. Mounted mint 1928 3d Bright blue. SG108. Fine used 1928 3d Bright blue. SG108. Heavy mounted mint 1928 3d Bright blue. SG108. 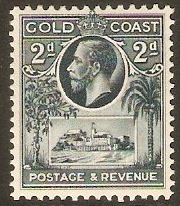 King George V definitive stamp. 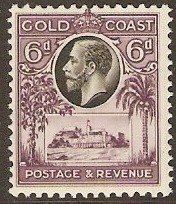 Gold Coast 1928 6d Black and purple. SG109. Mounted mint 1928 6d Black and purple. SG109. 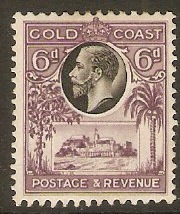 King George V definitive stamp. Gold Coast 1928 1s Black and red-orange. SG110. Mounted mint 1928 1s Black and red-orange. SG110. 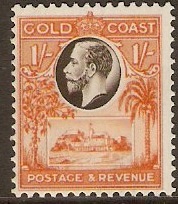 King George V definitive stamp. Fine used 1928 1s Black and red-orange. SG110.